The Tornadoes Worksheet – Get our educational and fun FREE to download printable find the hidden words game. This fun facts about tornadoes for kids worksheet includes a fun word seek game in addition to a missing-and-hidden word search game. Our tornadoes for kids worksheets are free to use as many times as you desire. You are permitted to download and print the tornado fun facts for kids worksheet for free to use at school or at home. This free printable worksheet all about tornadoes for kids is appropriate for kids in Primary school in First Grade to Fifth Grade as well as for kids in Kindergarten and kids in Preschool. The interesting facts about tornadoes for kids worksheet is a fun way to get your child’s attention during science enrichment classes or homeschooling. Young kids who like find the hidden word puzzles will have fun playing the words game while they learn fun facts about tornadoes for kids. Kids in Elementary school from Grade One up to Grade Five can use our free to download tornadoes facts for kids worksheet as a reading comprehension exercise. Your kids will learn well about tornado formation, because most kids will need to re-read the tornadoes fun facts to find what all the missing words are. This is a great exercise for kids to remember science facts about tornadoes, as well as developing better reading comprehension skills at the same time. Kids in Kindergarten and Preschool who haven’t yet learned to read, can enjoy the free find the hidden words game about tornadoes for kids as a fun and educational listening comprehension game. Educators can read out loud to the kids the interesting facts all about tornadoes and then ask the children to remember what words are missing in the puzzle. Teachers can help the kids learn to recognize words and find the hidden words in the word seek puzzle game. Parents can use our free to download tornadoes for kids hidden words game to do homeschooling activities or early learning activities with their kids and spend fun educational time educating their kids about tornadoes. Teachers can use our free printable all about tornadoes worksheet to supplement science classes at school and interest kids in learning about tornadoes. Educators can use our free find hidden words game about tornadoes for science enrichment classes or extra curriculum learning programs. EasyScienceforKids.com is the best parent and teacher resource for free science worksheets. We offer many educational free to download printable science worksheets and hidden word puzzle games for kids. Use our fun science activity sheets to make learning science a fun experience for your children! What are tornadoes? Tornadoes travel faster than 300 miles per hour and destroy everything in their path. Part of the reason that tornadoes occur is when warm air mixes with cold air. Tornadoes usually happen in the spring and summer. Sometimes they bring hail with them. Learn more fun facts about tornado formation by downloading the free printable tornadoes worksheet for kids! [sociallocker]Download our fun find hidden words game all about tornadoes for kids. Download the FREE Tornadoes Worksheet for Kids! 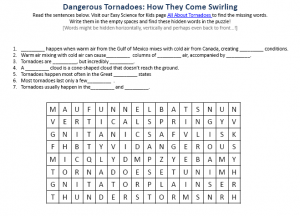 Did you enjoy our fun FREE Tornadoes Worksheet? Read lengthy information about Tornado formation here. Declan, Tobin. " Tornadoes Worksheet - Free to Download Printable Find Hidden Words Game - ." Easy Science for Kids, Apr 2019. Web. 26 Apr 2019. < https://easyscienceforkids.com/tornadoes-worksheet-free-to-download-printable-find-hidden-words-game/ >.